This page contains a boss strategy guide on Skriviks, the Sharp-Eyed in Mission 3 - Spark in Destiny 2, including tactics, and tips and tricks in the game. 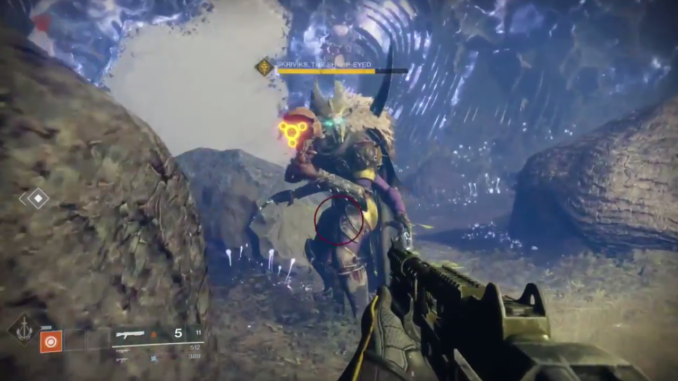 Shriviks The Sharped-Eyed is the first boss encountered in Destiny 2, during the Main Story Mission 3 – Spark. He will appear at the end of the mission’s path after you clear the area of a wave of Dregs and Wretches. Skriviks is armed with a powerful gun, as well as an area-of-effect explosion when you are too close to him. The fight is relatively easy since the area provides you with a lot of cover from his attacks, as well as letting you charge you Super in the area. When Skriviks appears, be aware of the columns emitting light around the battlefield. These will charge your grenade and your Super ability. Once you’ve run out of charge, head towards a column to charge your Super. If you did not clear the area of the Dregs and Wretches, the fight with Skriviks will be more difficult. Eliminate these enemies first while avoiding Skriviks. Once there are only a few weak enemies left, focus on defeating the boss. Skriviks mostly attacks with his gun, so move in and out of cover when he starts to fire. If your shield is low, hide behind one of the rocks and wait for it to recharge. It is recommended to use Power Ammo on him to deal high amounts of damage. Using your Super is also a good way to quickly defeat him. Skriviks moves very slowly, so staying mobile is very important for the fight. Do not also underestimate his reach, as he can attack you with his arms at surprising distances. When you can decide to use melee attacks on him, be careful not to get caught in his AoE blast, which will deal high damage to you. After defeating the boss, you will progress to Level 2.